Having your own business might be something that you envisioned for a long time. Now that you have an idea on what business to pursue, should you jump in right away and get started? No matter how excited you are and how good you think that idea is, it’s still best to pause and validate if your business idea. Validating your startup idea doesn’t necessarily eliminate the risk of failure. However, this will tell you if it has a bigger chance of succeeding. Plus, it will help determine if you are on the right track when it comes to your plans. One of the things to ask yourself is what problem you are trying to solve or eliminate? Your product or service must be useful for your target audience. It should be the solution for their specific issues or it must make their lives easier. Know your market. Decide on which group of consumers you will be focusing on. Do your research to find out about their needs, wants, and expectations and see if your idea meets them. What is “Duct Tape Selling” about? Selling is changing! Or more like, Selling has changed! Once upon a time the sales person offered insight and information about products and services that could be found nowhere else. Not true anymore. Between Social Media, Websites, John Jantsch, and other online tools, the buyer has all the information of the world at their fingertips. In his book, Duct Tape Selling, John Jantsch offers the solution to selling in today’s information overload environment. “With social networks such as LinkedIn, the sales person may have a relationship with a prospect before the prospect knows he or she has a need” says John. When sales people do a good job of using social media, the content they share positions them as a subject matter expert and a resource for the prospect. This requires a tighter integration between the Sales and Marketing teams. The Marketing Team is usually responsible for developing content. Instead or in addition to publishing content through mass media, they can share it via the Sales Team’s social media channels for a more personal approach. This also creates the opportunity for a prospect to respond directly to the sales person via the social media channels. According to John, “this approach to sales and marketing requires a shift in company culture and a possible change to the compensation model.” The company needs to see the sales team as an extension of the marketing department as well the source of sales. The sales person’s online reputation requires time to build and may not match up with short term sales goals based on an “old school” cold call, knocking-on-doors model. “Prospects are too sophisticated for the old approach” says John. I hope this short article has caused you to consider how you and your company are using social media to create more sales results. Duct Tape Selling is available on Amazon and look for John Jantsch speaking in your local community. What can we learn about Social Media from the Carwash Business? This article originally appeared in Professional Carwashing & Detailing where I was interviewed about Social Media. I thought you might find tips and relevant information here for your business. Social media is one of the biggest buzz words in the business world, and it’s something that everyone says you need, but not everyone understands how to use. Professional Carwashing & Detailing interviewed three experts in the field of social media about how carwashes can best utilize it for public relations and marketing purposes. And while Facebook is still the most important social media site, there are others that you should be using to help improve your customer realations and get the word out about your carwash, according to the experts. Facebook may have lost some of its “cool factor” with the youth, but Blane Russell, president of Social Eyes Marketing, said it’s still the most important social media website. “Make sure you’re doing Facebook in a big way, because it’s the 800 pound gorilla,” he said. J.R. Atkins is the author of the book “Social Media 2.0,” and also a speaker and consultant on social media. He said that “Facebook is definitely the place to start, and then grow based upon your market and what you learn from Facebook.” While Facebook isn’t the only social media website you should use, Erin Sullivan, social media manager, agrees that it’s the most important resource for carwashes. “For the carwash industry Facebook is still number one.” She said that both Facebook and carwash industry appeal to a large audience, which makes them an ideal fit. The experts have some tips on making Facebook a good use of your time. Russell said that using Facebook to give away free carwashes is one way that his clients have gained followers. The hard cost of the wash is very low, and the number of followers it can help you get is high, he said. Facebook isn’t just about selling you to people, it’s also about entertaining them, according to Russell. “Everyone’s natural nature is to try to sell all the time, but if you want to get liked, amuse them, and they’ll like your page” he said. “Ask open ended questions, like: “Does your car have a name, and if so, why,” and you’ll start a conversation rather than turn people off with a sales pitch. He also recommends that you post regularly, at least a couple times a week, and that you have some humor and personality in your posts, so that people appreciate them. More articles on: Social media Social media is about building up loyalty and community, according to Atkins. He said it’s important to respond back to people on Facebook that contact you, and create posts that are designed around the types of things that your customer base is interested in. Facebook isn’t just about getting new customers, but keeping ones you have, according to Atkins. He said wash owners he’s worked with tell him that by “using social media, my customers keep coming back, and don’t stray.” A loyal customer is very valuable to a carwash, so keep them informed about what’s going on at you wash. By creating a Facebook account, and not using it, Sullivan says you’re doing more harm than good. “It hurts the business more than anything when they [Facebook account owners] don’t pay attention.” People recognize quickly when you aren’t engaged in your Facebook account, and not only will they not like your page, but they might think less of your business, she said. Her recommendation is to show some personality, and realize that every post you make doesn’t have to be about carwashes. 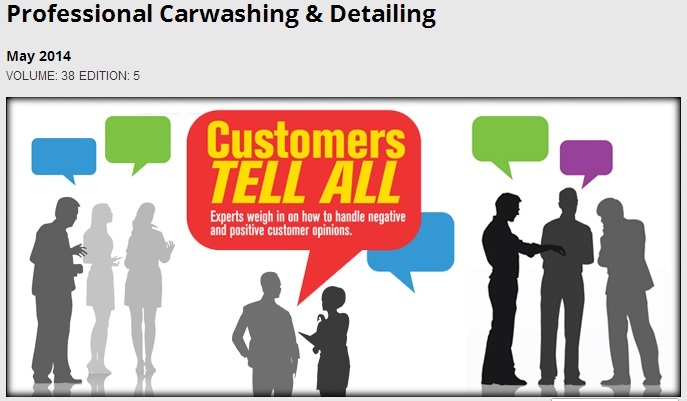 “Your customers are not simply carwash customers, they have other interests as well,” she said. Another tip Sullivan has is to link your other social media accounts to Facebook when possible, to eliminate extra work, and connect across multiple platforms. While Facebook is still the most important social media website, there are many others that your wash can benefit from using. LinkedIn is a place that people go to discuss business, and because of that it has some advantages over other social media outlets. Atkins said that it’s “where your professional credentials live online.” He added that LinkedIn is important for wash owners who are hands on, and looking to work with other established businesses. LinkedIn is a better place to communicate professionally, according to Sullivan, who said it is definitely a supplemental tool, but can be effective for certain business situations. Russell agreed with the other experts that the major advantage about communicating on LinkedIn is that “no one will get upset or offended if you’re direct with them” about wanting to talk business. Setting up a profile, and learning how to use LinkedIn is very simple, so while you may not see a big initial return from creating an account, you will have a “virtual resume” and a place to connect with other businesses, according to the experts. While Google+ hasn’t taken off the way many predicted, it does have importance as a social media tool, even if it’s in a way that you might not think. “If you own a business, you need to have a presence,” said Russell. He also recommends usingGoogle Local as the place all of your reviews are put through to improve your search rankings, and get the word out about the great work your carwash does. More articles on: Multi-profit centers Google holds a lot of power as a search engine, and adding your business to Google+ gives your wash a better ability to be featured highly when a customer searches for it, according to Atkins. When you use Google’s search engine for a carwash that has a Google+ account, you will see information for its Google+ on the search page. “Google+ is definite must have now,” said Sullivan. She explained why it’s so important for business owners. “If I have a Google+ page, I now control what shows up in the Google search. When it comes up in search results, it will have the carwash name, it’s pulling the name, the description, the information … you know can dictate through your Google+ page.” She added that it’s important to get your presence on Google+ now, while it’s still an overlooked medium. It may not be the place you will go to communicate with your audience, but if you’re not on Google+ you’re missing out on improving your search engine optimization, which is one of the major ways people find out about a business. The experts see Instagram as a supplemental tool, but an important one none the less. And the best thing about it is how simple it is to use. Grab your smartphone, take a picture, write a caption, add a few hashtags, and you’re done. “The beauty of Instagram is that people are going to promote you if they get excited about what you’re doing,” said Russell. Instagram is particularly popular with young people, and learning how to use it now can keep you ahead of the pack. Instagram is the perfect place to host pictures you’ve taken for a charity event or to showcase something unique or interesting that happened at your wash, according to Atkins. Another great thing about it is that it can be integrated with other outlets like Facebook and Twitter. For example, Atkins said you could “promote your event on Facebook, and then post pictures of the event on Instagram.” The ability to place pictures across multiple platforms makes Instagram a tool that can help you increase your Facebook and Twitter as well. “People respond to visuals more than something they read,” said Sullivan, which is a major reason why Instagram has become so popular. She sees it as an additional tool, and one any wash owner can utilize because of its simplicity. “It’s a good sort of extra … I think it’s a clear winner for how easy it is to use, and connect with other platforms.” Signing up for an account takes minutes, and you’ll be snapping pictures and posting them on Facebook and Twitter in no time. Taking pictures is fun, and Instagram is so easy to use. While Twitter is a platform that seems pervasive in our society, it is also the one that most people don’t understand how to use well, according to Atkins. You might not use Twitter to cultivate a following, but it is a great place to get direct feedback from your customers, he added. Read also: How to start a carwash articles Twitter is the place that you can “turn a raving lunatic into a raving fan,” according to Atkins. The way you do that is by responding to people who tweet you. For direct communication, Atkins sees Twitter as a better tool than Facebook, “it’s like texting,” he said. If someone finds you on Twitter and asks you a question, it’s easy to grab your smartphone or hop on your computer, and immediately respond back. If Facebook is the place to communicate to people, Twitter is the place for people to communicate to you. “It’s a conversation more so than other social media sites,” said Sullivan. “You need to expect to interact.” Twitter, more than Facebook, is about a two way communication between you and your audience, according Russell. Sullivan recommends how you can use Twitter as more than a way to communicate with your customers. She said you start by following some hashtags, and seeing what successful carwashes and other businesses do when they’re tweeting. It’s also important to think of the phrases that your customers would be searching for, and post on those hashtags. Russell said one way to effectively use Twitter is to find the important people within your community, and tweet them. Twitter is a conversation, so just like talking to people, there’s ettiquette, and things you can do to make follow and unfollow you. Once you figure out how to have a conversation on Twitter it can be a great tool. Even if you don’t want to utilize it for communicating to your audience, you should have an account so they can communicate to you. Facebook Ad’s for “Likes” Do Not Work? Check out this video by Derek Muller of the Veritasium on why Facebook Ads for Likes do not work. He’s a science guy and most of his content is science related. But on this one, he applies his scientific approach to the Facebook Ad Model to see how it works or doesn’t. Box Thinking: Inside or Outside? “Thinking outside the box” is such an over-used term yet I still hear it used to describe looking at life, a systems, a product, a problem or an issue in a new or different way. But, to think outside the box, don’t you need to understand what is in the box? Check out the list below and see if you can think of additional material that should be in or outside the box. As we enter 2014 my hope for you is that you are able to create remarkable results with remarkable ease. Perhaps you can think outside the box to new highs in your career by looking at what is already in the box. “People Tribe, Fish School, Cattle Herd and Birds Flock” and so it goes, says my client and friend Kathy Dudley of Compassion Creates Change. Then she goes on to explain the 5 Stages of Tribes (below). My eyes widen and I frantically begin to take notes as the information and this model of behavior resonates with other ideas bouncing around in my head. So, I share the following resources with you in hopes of helping you and your organization excel in the new year. Lastly, here is an excerpt from the book which I highly recommend. Every company, indeed, every organization, is a tribe, or if it’s large enough, a network of tribes—groups of twenty to 150 people in which everyone knows everyone else, or at least knows of everyone else. Tribes are more powerful than teams, companies, or even CEO’s, and yet their key leverage points have not been mapped—until now. In Tribal Leadership, Dave Logan, John King, and Halee Fischer-Wright show leaders how to assess their organization’s tribal culture on a scale from one to five and then implement specific tools to elevate the stage to the next. The result is unprecedented success. In a rigorous ten-year study of approximately 24,000 people in more than two dozen corporations, Logan, King, and Fischer-Wright refine and define a common theme: the success of a company depends on its tribes, the strength of its tribes is determined by the tribal culture, and a thriving corporate culture can be established by an effective tribal leader. 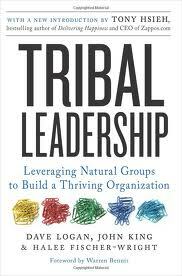 Tribal Leadership will show leaders how to employ their companies’ tribes to maximize productivity and profit: the authors’ research, backed up with interviews ranging from Brian France (CEO of NASCAR) to “Dilbert” creator Scott Adams, shows that more than three quarters of the organizations they’ve studied have tribal cultures that are merely adequate, no better than the third of five tribal stages. • Stage One: The stage most professionals skip, these are tribes whose members are despairingly hostile—they may create scandals, steal from the company, or even threaten violence. • Stage Two: The dominant culture for 25 percent of workplace tribes, this stage includes members who are passively antagonistic, sarcastic, and resistant to new management initiatives. • Stage Three: 49 percent of workplace tribes are in this stage, marked by knowledge hoarders who want to outwork and out-think their competitors on an individual basis. They are lone warriors who not only want to win, but need to be the best and brightest. 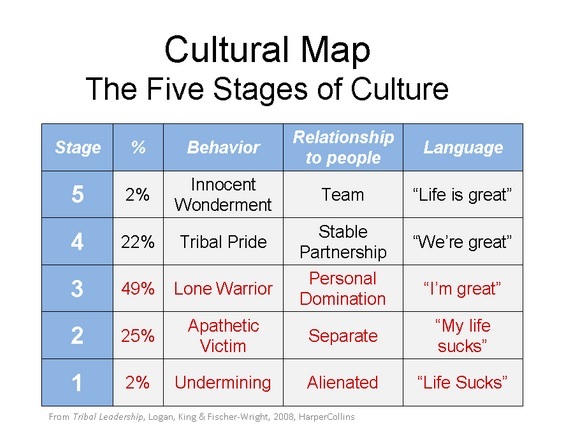 • Stage Four: The transition from “I’m great” to “we’re great” comes in this stage where the tribe members are excited to work together for the benefit of the entire company. 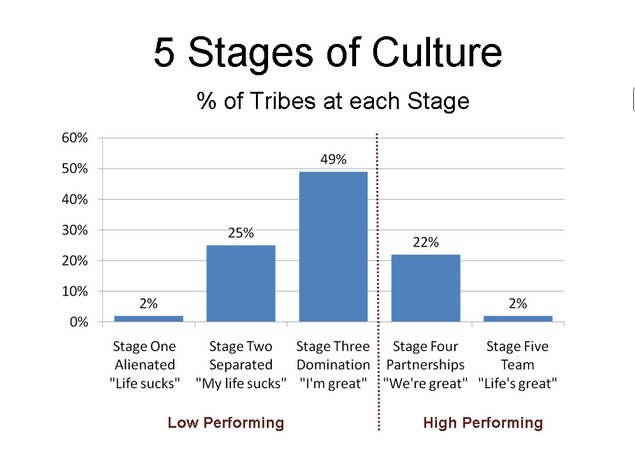 • Stage Five: Less than 2 percent of workplace tribal culture is in this stage when members who have made substantial innovations seek to use their potential to make a global impact. Leaders, managers, and organizations that fail to understand, motivate, and grow their tribes will find it impossible to succeed in an increasingly fragmented world of business. The often counter-intuitive findings of Tribal Leadership will help leaders at today’s major corporations, small businesses, and nonprofits learn how to take the people in their organization from adequate to outstanding, to discover the secrets that have led the highest-level tribes to remarkable heights, and to find new ways to succeed where others have failed. I look forward to reading your comments, receiving your emails, chatting on the phone or in person about these concepts. Do you log into LinkedIn and think “is something different today?” The answer is yes. With the new development platform they rolled out last December, LinkedIn can make changes multiple time per day. Occasionally the change is big enough to sen out an announcement like the one below. The big change in this announcement is how you can add a “Hero Image” to your group page similar to “Cover Image” on a Facebook page. Good luck with your LinkedIn Group and let me know if you have questions or comments on this blog post. Do You Have Digital Meetings? What I mean is, when you meet with others, are there digital devices involved? Are there laptops, phones and tablets on the table with people “typing” away on their phones and keyboards? 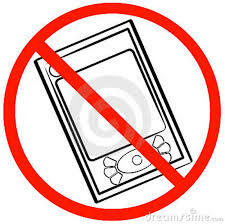 As I visit organizations, I see that the use of digital devices in meetings really depends on the organization culture. Some organizations are digital oriented, others focus on short meetings with updates and actionable items while other have meeting that are so slow and boring that if people could not use their device, they’d fall asleep. What do you see in your organization? Can you use a device in your meeting? Is your organization wrestling with how to deal with devices in your meetings? I look forward to hearing from you by phone, email, or blog. 8/26 What’s Your Organization’s Mobile Strategy?